What do you do when are so happy you may explode? Well, in the picture book Anna Hibiscus’ Song, Anna Hibiscus asks this question to her many family members as she experiences a day in her home in amazing Africa. Her Grandfather counts the reasons he is happy. Grandmother squeezes Grandfather’s hand. Her aunties work on mashing yams for dinner and her cousins do cartwheels, somersaults and flips. What do you think Anna decides to do when she is happy? It’s fun to find out! 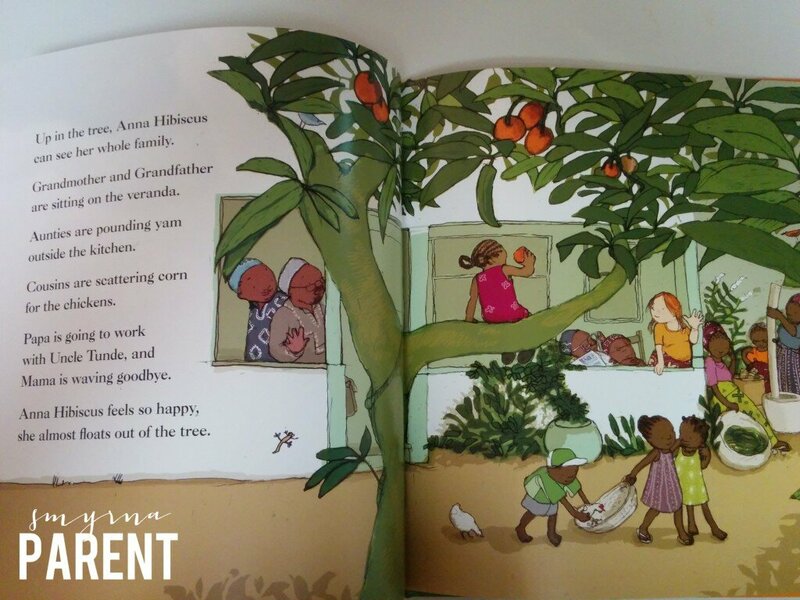 Published in 2011 by Kane Miller, Anna Hibiscus Song shows the world a lovely little girl who lives in Africa with her Mother, Father and extended family. The book illustrations reveal that Anna is a lighter skin color than some of her relatives and soon you see that her mother is white with blond-brown hair. The colorful, rich illustrations showcase the exotic surroundings – mango trees, white stucco homes, and beautiful African print skirts and headscarfs. 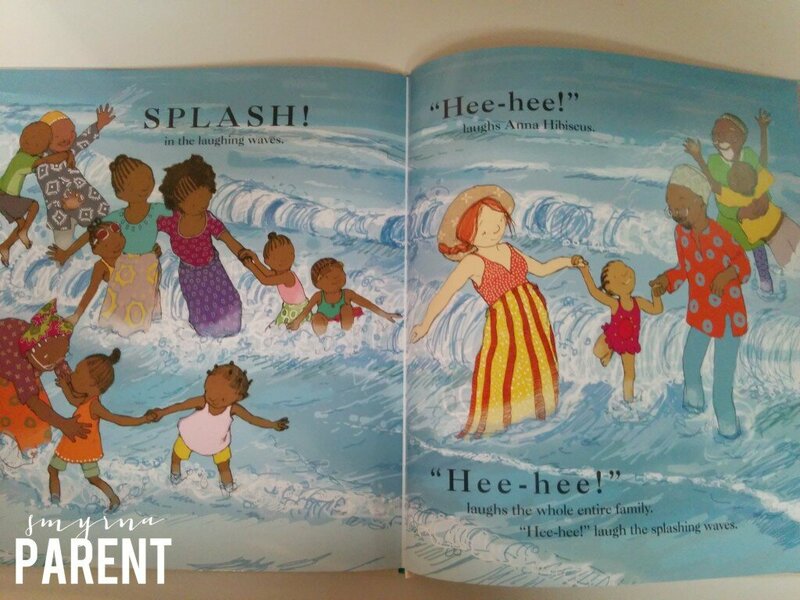 In Splash, Anna Hibiscus, another Atinuke picture book published in 2013, Anna visits the beach with her Papa, Mama, Grandmother, Grandfather, Uncle Tunde, the aunties and cousins including Benz, Wonderful, Joy, Clarity and Common Sense. Anna tries to get her family to come and splash with her in the waves, but they are busy doing other things they like to do on the beach. You’ll have to read the story to find out what Anna does when the waves of the ocean start calling her to go and play in them. The Atinuke books are written about an unidentified country in amazing Africa. Atinuke is a Nigerian-born storyteller and author who was raised in both the U.K. and in Nigeria. Along with the bright, colorful illustrations of U.K.-based, Lauren Tobia, these two picture books begged to read again and again. Anna Hibiscus books show family life for one little girl across the ocean and bring it to life for those us of here in the suburbs of Smyrna. As a children’s book distributor and parent whose husband is from South Africa, I appreciate the cultural lessons and the refreshing global settings of these books. 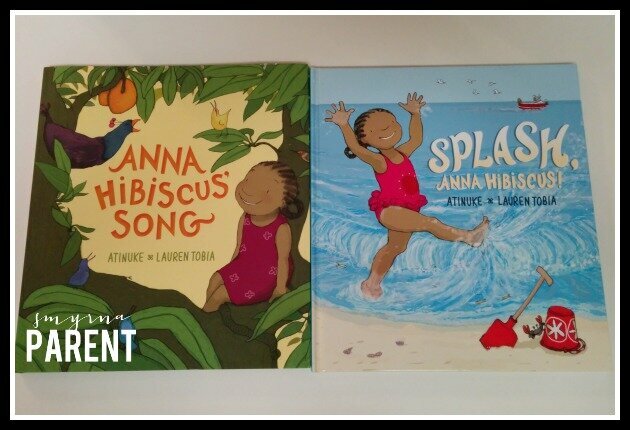 Look for the hardback picture titles by Atinuke: Anna Hibiscus Song (ages 3-7, $12.99 hardcover w/dust jacket) and Splash, Anna Hibiscus (ages 3-7, $14.99 hardcover w/dust jacket). These make beautiful, unique gifts. Also, there are four early paperback chapter books of Anna Hibiscus (ages 5-9, pp 112). The paperback chapter books are $5.99 each are entitled: Anna Hibiscus, Book 1; Hooray for Anna Hibiscus! – Book 2, – Good Luck Anna Hibiscus! – Book 3 and Have Fun Anna Hibiscus – Book 4. Books may be ordered thru Usborne Books and More and my website. Carol Kleywegt is from Memphis, Tennessee and moved to Atlanta to start her marketing career in 1996 with what used to be the BellSouth Corporation. She lives in Smyrna, Georgia with her husband and 3-year old son. After working many years in marketing management for technology and software companies, Carol is enjoying raising a family and being active in the community, but she can’t resist the itch to be in business. She currently works from home, selling children’s books as an independent distributor for Usborne Books and More through her website: www.gakidsread.com.